If you are currently dealing with chipped, cracked, decayed, or missing teeth, Harrisonburg Family & Cosmetic Dentistry can fully restore them using natural-looking crowns and bridges. With the help of our eye for detail, we’ll make it look like nothing ever happened to your smile in the first place. A dental crown is a tooth-shaped restoration that simply fits over the top of a damaged tooth and fully encapsulates it. It protects the tooth from trauma as well as restoring it structurally and cosmetically. If you're missing one or more consecutive teeth, two crowns can be applied to the teeth surrounding the gap in a person’s smile. 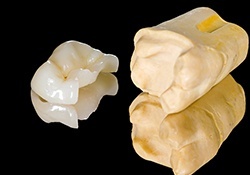 Then, these crowns can be attached to prosthetic teeth in order to close the space, forming a dental bridge. 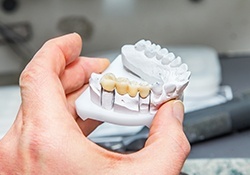 Traditionally, if you wanted to have a tooth repaired with a dental crown, it would take at least two appointments to the dentist’s office to compelte the process. In today’s fast-paced world, that simply takes too long. 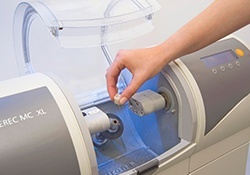 With our CEREC system, we can quickly repair your tooth with custom-made, all-porcelain crowns that are designed, milled, and placed in only one appointment. Now, you don’t have to sacrifice your schedule to get the dental care that you need. An inlay is used to restore the internal structure of a tooth while an onlay rebuilds the rough upper edges of a tooth, known as the cusp.